I guarantee that if I asked most of my adult friends if they could ride a bike, they would laugh at the question and reply in the affirmative. It is considered a ‘norm’ that you learn to ride a bike as a child in our society. I certainly did; somewhat reluctantly as I recall, although I did admire the bright metallic blue bike with white saddle that my dad proudly brought home for me one birthday. Up and down our avenue he took me, encouraging me to stay balanced and keep going. Eventually, I did, but I can’t say that I was ever a very confident bike rider; I was the kind of cyclist who got off the bike and walked if a car went past me. It’s little wonder I have yet to successfully tick the box ‘learn to drive’! But that’s another story. Cycling is a very pleasurable form of exercise as well as a means of transport form A to B, and there is a growing number of adults who didn’t learn to ride a bike in childhood, and who are now in their 50s and taking to pedal power through a number of local government and cycling organisation initiatives. Perhaps you’d like to join them? There are a few ways you can find out about adult cycle training. 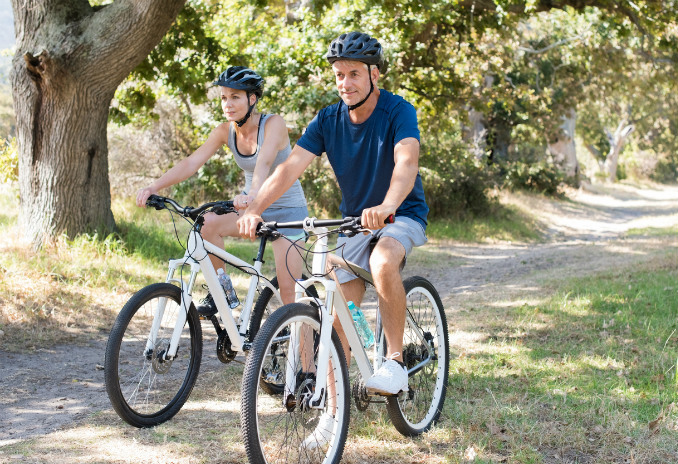 As Xenia Taliotis mentions in her article (linked to above) about taking on the ‘learning to cycle’ as a 50th birthday year challenge, you can enquire at your local authority offices, where you should be able to get information. If you’re a London resident, then the capital’s Transport for London has a dedicated area of its website where you can discover what is available around the numerous London boroughs. TfL also offers free cycle training itself and you’ll find lots of cycling tips at its ‘Cycle Training’ page. And wherever you are in the country—in or outside London—there is the wonderful BikeRight. This is a one-stop shop for all aspects of bike riding, whether you’re a prospective new cyclist, somebody who trains new riders, an organisation that promotes safe bike riding and driving, or a community body, such as a school, that needs somebody from BikeRight to provide cycling information. Male and female coaches If you meet BikeRight’s eligibility criteria then you can enjoy one of their many courses free of charge. I don’t think the criteria are tough to fulfil because all that is required is that you live, work or study in the city/region where you’re applying for the course, and that you’re over the age of 16. If for some reason you don’t pass the eligibility test, then the courses are a reasonable £50. The Improvers course is ideal for returning cyclists who feel daunted by the idea of cycling on today’s roads. As we know, there is a significant difference between the levels of traffic around today compared with the 1950s and 60s. Watching cyclists negotiate traffic in London has the same effect on my stomach as watching that chap climb the Eiffel Tower without ropes. Teaching cyclists how to cope with urban roads can only be a good thing in my opinion. The Advanced level class is offered on a 1-1 basis, and participants ride a route with a trained instructor. It’s excellent for anyone who wants to commute to work and will face hazardous junctions and roundabouts en route. I may have exaggerated when I mentioned Bradley Wiggins, but who knows; you may find that you want to progress to that style of cycling – it is great exercise after all. You can also learn how to look after your bike and there are experts at BikeRight who will advise you about the bike you should buy. Transport for London, and other places, also offers the opportunity to rent a bike if you don’t want to splash out until you’re sure about the whole pedal power thing! Meanwhile, I saw an adult tricycle just the other day; I think I’d feel so much safer with three wheels instead of two – and it’s still cycling – sort of!